It’s hard to believe that last week was the 10th anniversary of The Office premiere. The show was a huge success and was beloved by fans everywhere. It’s still just as popular today thanks to Netflix and other streaming sites. In honor of the anniversary of one of the most influential shows, we’re counting down the ten best episodes of The Office. 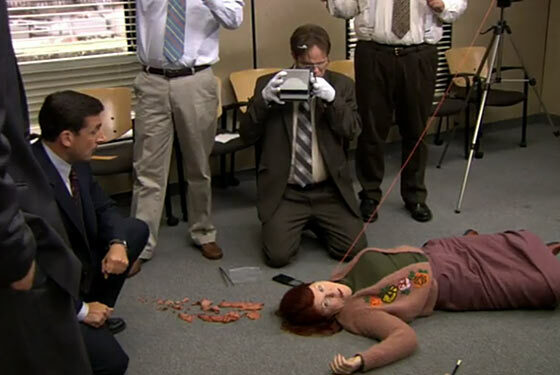 Michael distracts his employees with an over the top murder mystery game. The episode starts off with a surprisingly wonderful music number of the cast of Sweeney Todd, the local play Andy is starring in. The whole office goes to see it, but throughout the play Michael sulks because he auditioned but was not cast. It ends with Michael’s audition tape, which happened to be him performing an entire episode of Law & Order. Pam is very drunk and very excited about her win. In this episode we see the first award ceremony of the legendary Dundies. The whole office gathers at a local Chili’s where Michael and Dwight host the evening. Pam gets hilariously drunk and the romance between her and Jim becomes very clear. Michael and Jan invite Jim, Pam, Angela, and Andy over for dinner. The night is a hysterical disaster where Michael and Jan passive-aggressively fight all night, make the guests feel extremely uncomfortable. Jan accuses Pam of being in love with Michael and Dwight, upset he wasn’t invited, crashes the party. Andy hosts a huge garden party at Schrute Farms to impress his parents and boss, Robert California. Jim pulls a hilarious prank on Dwight where gave him a fake book on how to host a proper garden party, which includes closing ceremonies and a strange dance before dinner. There is also plenty of Mose to go around. Michael is broke and is trying to get his problems to go away. Jan is bleeding Michael dry with her constant spending. Michael tries to hop a train and run away from it all. Meanwhile, Jim and Pam spend a night at the Schrute Farms Bed & Breakfast, where they stay in an irrigation-themed room, learn how to make tables, and are read Harry Potter by Dwight before bed. Michael is leaving for Colorado to go live with Holly, and he needs to say goodbye to everyone. This episode is extremely touching and heartbreaking, but Michael’s last day at Dunder Mifflin is unmissable. Michael burns his foot in a George Foreman grill and is angry that no one is taking is injury seriously. Dwight gets a concussion trying to help Michael and acts very strangely all day. This episode is so simple but still hilarious and delightful. After many years, Michael’s original movie is finally complete, and the whole office is starring in it. It centers around Agent Michael Scarn who needs to save a hockey stadium from being blown up by the evil villain, Goldenface. The acting, plot, and special effects are so wonderfully bad that you will not stop laughing. This episode is a standout and clearly the best one. So which one of these is your favorite? And did we forget any? Let us know in the comments or tweet us using #glamorouspaper!